I was invited to speak at the Beer Industry Summit this past Monday where I was a panel participant on an e-commerce panel. I also stayed for the Wine & Spirits Daily Summit the following day. Both summits were super interesting and I thought I would share some tidbits from my five days in the Sunshine State (besides the fact it was freezing there). The content that the average person scrolls through every day on their phone is equal to the height of the Statue of Liberty. Breakthru Beverage receives approximately 3,000 requests per year (across all markets, but still!) for distribution. If a new brand had to pick just one thing to really invest in, packaging is key. Craft = honesty. Consumers like to buy from small companies and local families because they don’t think they will get “ripped off” by their neighbors. Captain Morgan was very close to being killed before it was released. When Tito’s first came out, nobody would take it. The few distributors that did in the very beginning are reaping the rewards today. Mike’s Hard Lemonade’s White Claw Hard Cherry Seltzer is delicious. When looking at the success of a brand, accounts sold/cases sold is not a good indicator. Look at reorders. Also, consider Instagram – how many people are taking pictures of your brand and engaging with the product? Nielson shared some data that was really interesting. 75% of new products fail. Rosé, ultra-premium gin, bubbles and Cabernet Franc are trending. Tequila is up 8% on premise. Cognac is picking up speed. Sangria is a new product that is growing at a tremendous rate. Alternative packaging (kegs, cans, boxes) continue to grow. On-Premise experts are seeing trends for locally made products, especially amongst travelers and millennials. One big rumor in the halls: The big distributors are really tightening down on their portfolios. One in particular now has a 9-month vetting process before taking on new suppliers. It’s like having a baby! A lot of great content. Many great connections. 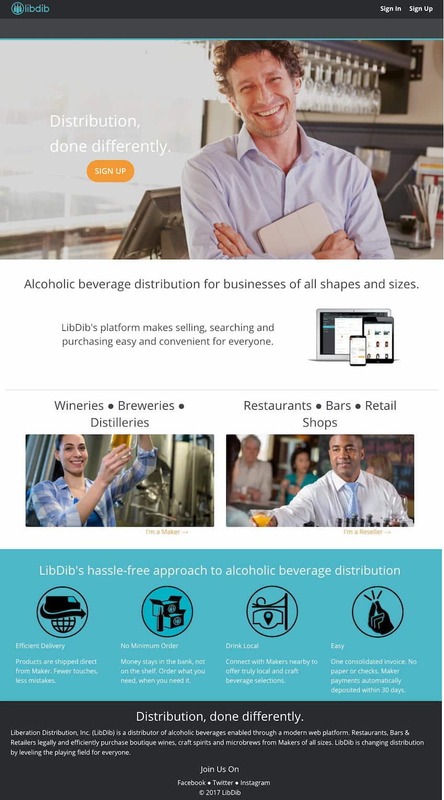 And so many data points when it comes to three-tier consolidation, the large proliferation of new and exciting craft products, incubation partnerships with distributors, and e-commerce habits and growth…LibDib is on to something big.